World demand for green packaging is projected to rise 5.7 percent annually through 2010. Recycled content packaging will remain the dominant product type, while reusable and degradable packaging grow the fastest. The Asia/Pacific region will see above-average gains and remain the largest regional market, due to its large food and beverage industries. 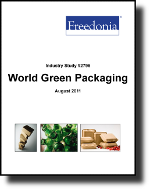 This study analyzes the $160.8 billion global green packaging industry. It presents historical demand data for the years 2000, 2005 and 2010, and forecasts for 2015 and 2020 by product (recycled content packaging, reusable packaging, degradable packaging), market, world region and for 19 major countries. The study also considers market environment factors, details industry structure, evaluates company market share and profiles 47 industry players, including Georgia-Pacific, Tetra Pak International and Illinois Tool Works.